Cooking requires many more ingredients than just food. It requires a clean kitchen space, organized pantries, refrigerators, cabinets, and drawers, the perfect recipe, and most of all, the right utensils you need to dice, slice, scoop, and chop up your ingredients. However, one of the most frustrating things that can happen in the kitchen is those very important utensils becoming dull to the point where they are practically useless. Or, perhaps you thought investing in one of those fancy sets of utensils that are supposed to be sharper, lighter, and more durable, but only to find that they required an extra amount of special maintenance in order to keep them from getting rusty, leaving you back at the drawing board. Regardless, there are many sets of utensils out there designed by expert chefs that are meant to give you an easier time in the kitchen as well as utensils that are long lasting. But as most of us probably know from past experience, not everything works like the charm the company says it is. However, this one utensil set by Schandal thinks it has what it takes to give you the perfect kitchen knife: the Damascus Steel Chef Knife. But, does it really work like it says it does? Are other customers liking it and seeing all of the promised benefits that the product guarantees? How well does it compare to all the other kitchen knives? I will be answering all of those questions and more in this ultimate guide and review of the Damascus Steel Chef Knife. What is the Damascus Steel Chef Knife? How Does the Damascus Steel Chef Knife Work? When writing reviews, we realize that it is not only important for us as the reviewers to be honest and accurate, but it is also equally important for the company, brand, and product to be honest and accurate as well. If a company has promised something from their product that it has not given to the customers, then I see that as false advertising and would never recommend you purchasing from them. In a similar way, if the product does not do much at all compared to its competitors, as well as is listed at an insanely or unreasonable price that is not convenient at all to you as a potential customer, then I also would never recommend it to you. Additionally, I am writing this review with a completely unbiased opinion about the product. The way I choose how well I rate this product, how I form my views of the product, and ultimately how I decide if I recommend it to you or not, is all based on the convenience of the product to you and most importantly, by reading the customer reviews. I also strive to present you with a balanced and completely realistic view of the product, giving you both the pros and the cons, as well as all of the facts that I know about it in order to help you make an informed decision as a buyer. And while there may be no such thing as a perfect product, there is such a thing as the right one for you. So, are you ready to find out if the Damascus Steel Chef Knife will make the best next kitchen tool for you? Because I’m ready to help you. The Damascus Steel Chef Knife is actually a set of two knives, one of which is 8 inches long, and the other of which is 6 inches long. These two knives include a chef knife as well as a utility knife. Unlike most chef knives and utility knives, both of these two knives are bigger than the average, in both length and width. This is because the knives were meant to be much more versatile in the kitchen compared to their typical competitors. But you might be wondering what the difference between the chef knife and the utility knife is. First of all, the chef knife is meant for chopping up and slicing through thick and heavy foods, such as meat, poultry, vegetables, fish, and more. It is 8 inches long, making it a bit wider and longer than the utility knife. This is so that it can cut through these thick substances much better and more easily. The utility knife, on the other hand, is the shorter knife in this set, with its length being 6 inches long. However, don’t be fooled — most other utility knives are only 5 inches long, making this one more versatile in the kitchen. Whereas the damascus steel chef knife was made to chop through thick foods and substances, the damascus steel utility knife is 2 inches smaller so that it can handle all of your small kitchen tasks, such as cutting up a small piece of fruit. Additionally, both of these knives are made specifically out of damascus steel, as the name implies. The damascus steel that decorates and makes up the knife is quality VG-10 stainless steel, and meets the manufactured exacting standards. The damascus steel chef knife also makes the most out of its handle, as the company Schandal believes that the handle is the key to being able to cook with efficiency and without getting tired. Because of this, the damascus steel knife as well as the utility knife has handles that have been manufactured to sit easily and comfortably into your hand from ABS. This creates a great balance in both of the knives, helping you cut, chop, and dice your day away without experiencing fatigue in your hands, as well as to make sure that you have absolute control over the sharp blade. So now that you know about everything that the damascus steel chef knife promises to do for you and your next kitchen projects, how exactly does it do those things? What makes it different from the rest and how? To start this off, allow me to preface this by saying that it is important to always know and be aware of how any product works before buying it. If it promises you many benefits and results, always make sure that you are able to find out how it will do those things after you have used it. Firstly, the VG-10 stainless steel that makes up the material of all Schandal knives, and especially the Damascus Steel Chef Knife, is actually a technique for making knives that is centuries old. The whole point of this technique is to make the knives more durable than other knives, as well as to prevent it from becoming brittle, rusty, and dull. In addition to all of this, the stainless steel technique also gives the knives a much sharper blade and edges, which also help it to prevent from rusting and corroding. Overall, the whole science behind the VG-10 stainless steel technique is to give your knives a more durable point, meaning you don’t have to sharpen them as much as you would normally have to sharpen cheaper ones. Something that Schandal, the company that produces and sells this Damascus Steel Chef Knife set, emphasizes very heavily on is not only the innovative VG-10 damascus stainless steel that makes up the product’s material, but also the design of the knives. To them, the looks of these knives are second priority, with functionality being the first. Each one of the knives in the damascus steel chef knife set has the same signature design as every other knife from Schandal. This design includes a wavy pattern in the blade of the knife, making it very stylish and attractive. The waves are black and white, with artistic and squiggly lines that run through them, as well as circles that make what seem to be the shape of flowers. But not only does Schandal find it reasonable to decorate the blade with elaborate designs, but also the handle. In the handle of the knife itself is in the shape of a V, which seems to add more and more glory to the look of the damascus steel chef knife. All in all, Schandal believes that with the damascus steel chef knife, everyone who walks into your kitchen and sees it will instantly know that in your house, food means business. If you are an aspiring chef or simply a passionate cooker, this knife will definitely suit your fancy. We have talked about all of the amazing things that the damascus steel chef knife promises to do for you and your kitchen, as well as how it works and what it looks like. But something we haven’t touched on is the price of this elegant knife set…yet! Although the damascus steel chef knife was made by the cutlery company Schandal, I still have not been able to find an official website for the company. However, you can still order the knives online on Amazon.com​​​​​. 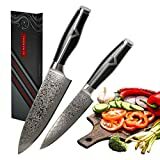 On Amazon, the damascus steel chef knife is listed for a price of $60 flat and with free shipping. And even though Schandal does not sell directly from any website (as far as I have found), they are the ones selling the knife on Amazon. I personally don’t think that I would ever buy a set of two knives for 60 bucks. I feel like that is unreasonably high, regardless of the elegant look of the knives and all that it does. However, what gives me this opinion the most is the fact that for $60, you are only getting two knives. I feel like if it was a set including several more, than this higher price would be a bit more bearable as well as understandable. Now that you know everything about what the damascus steel chef knife has to offer as well as how much it is being sold for, now it is time to take a look about what the previous buyers think about it. As I said earlier, the customer reviews are what shapes my opinions of the product more than anything else. So, are you ready to find out what everyone else thinks about the damascus steel chef knife? On Amazon, the knife set has a rating of 4 stars out of a maximum 5, but they are a combination of only 4 customer reviews so far. This simply means that although the product has a good rating, it hasn’t been a compilation of many people’s opinions. However, in the reviews, 3 customers have given the damascus steel knife a 5-star rating, saying that the knives look and feel just as beautiful as the company had promised, and that the handle did indeed have a nice balance to it. But in one review, the customer makes a statement that the knives aren’t real damascus steel. The customer complained that the knives he received were actually another brand’s and that the decor was simply a stamped in design in order to make it look convincing enough to be taken as a damascus steel. In the end, this customer gave the knives a 1-star rating. Overall, I think that the Damascus Steel Chef Knife is indeed a very innovative knife and has a lot for other companies to compete with. From the design to the structure and functionality of the knife, this Damascus Steel Chef Knife is something I definitely think any passionate chef would love to use and have in their home. However, I was a little disappointed to see that there weren’t many customer reviews left on Amazon, which also means that there weren’t very many opinions on the true effect of the knife. But 3 of the 4 customers said that they worked and looked just as well as Schandal promised, and that is a good enough customer satisfaction rate for me. The only thing that I still don’t quite like about the knives though is the price. Once again, I personally don’t think I would ever pay $60 for only two knives, but if you are serious about making a statement for your cooking, then I believe that the Damascus Steel Chef Knife will do the trick.